Serenity is on of my favorite images from Artistic Outpost. Here I used the Faux Sanding Technique from the August TJNL. Before cutting my panels, I stamped the image in Black Archival. Then stamped the image again on White card stock, layered on a Black and Green Panel, then lined it up over the first stamped images - sorta like spotlighting the main image. Don't forget you can save 15% on all your Artistic Outpost purchases when use enter code LS-15off. love this stamping technique - almost like out of the box, but better! Lovely design! 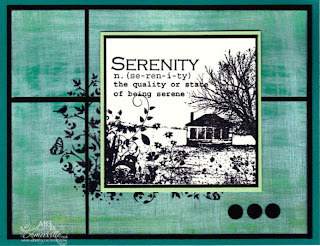 Your sanded background really lets that gorgeous Serenity image shine! What a fantastic card - I love the way you cut the panels, it feels like you're looking out of a window. Can't wait to try this idea. Beautiful! I really love that plate.